How do you transform an old, tired garden space so that it once again becomes a special part of your outdoor environment? Time to breathe new life into an existing outdoor space! Over time this garden has lost its original spark; gradually plants have succumbed to less than favourable growing conditions, the pavers have seen better days, and the free-form garden edges don't seem as attractive as before. Fortunately, one tree has survived to give some privacy and shelter. 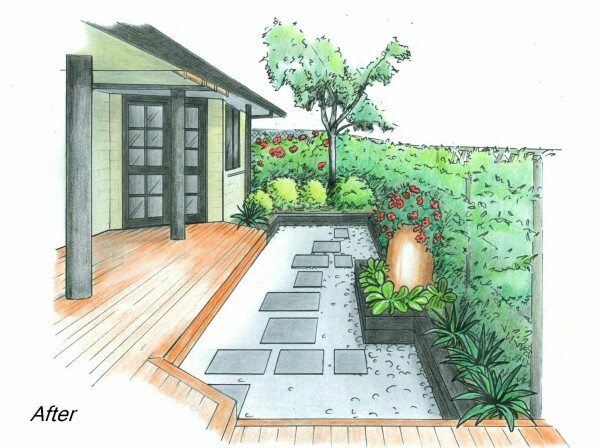 The drawing shows what could be done to create a new garden 'room' that compliments the seating area on the deck. Garden beds, constructed of stained timber, are raised so that drainage is improved. 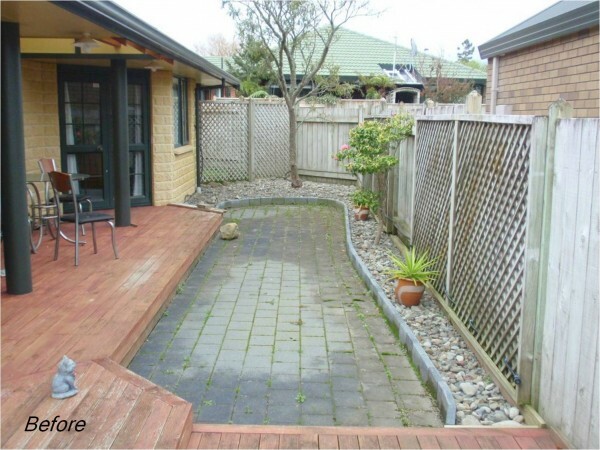 The long, narrow patio is broken up with a wider raised garden in the middle. Rectangular shapes are used to link the garden with the predominantly rectangular house. The paved area is filled in with the stones that were originally used for ground-cover, and an informal path of different-sized pavers gives a sense of movement. The planting can be kept simple, with or without climbers against the fence, low-growing shrubs, and a touch of colour.